Multnomah Falls. Plummeting 620 feet from its origins on Larch Mountain, Multnomah Falls is the second highest year-round waterfall in the United States. 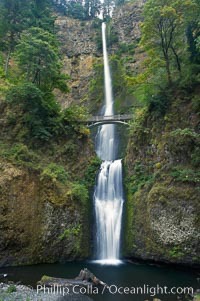 Nearly two million visitors a year come to see this ancient waterfall making it Oregon’s number one public destination. Stock Photography of Multnomah Falls.